In 2013, Clowns Without Borders Germany sent 2 clowns to Syria. 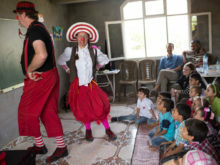 In 2013, Clowns Without Borders Germany sent 2 clowns to Syria, to perform 7 shows for 2000 people. 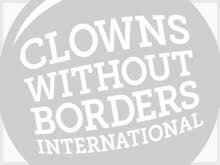 In 2008, Clowns Without Borders Spain went to Syria and performed 11 shows for 3800 people. 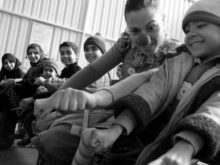 In 2007, Clowns Without Borders Spain went to Syria with the support of UNHCR and UNICEF. They performed 16 shows for 1700 people, as well as workshops for 2400 children.